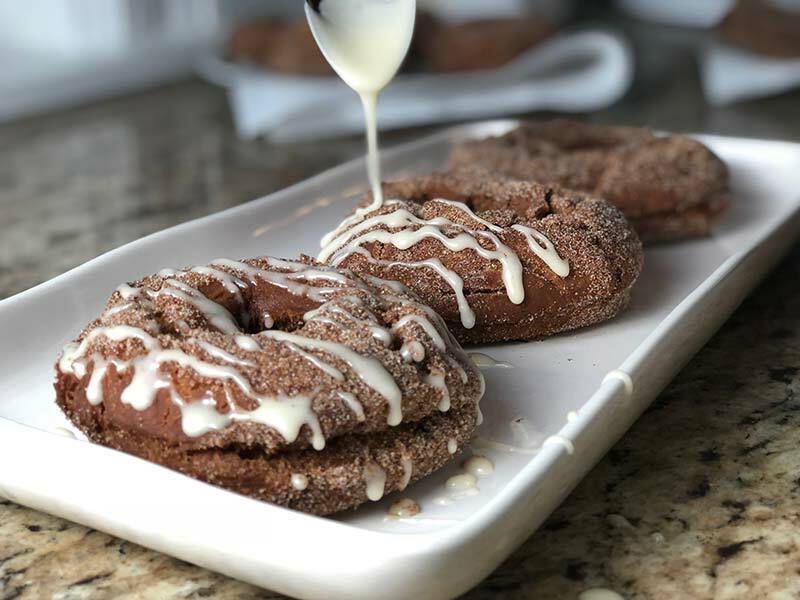 I couldn’t let apple picking season go by without making apple cider donuts. While I do love making baked donuts, these ones are fried and absolutely delicious. 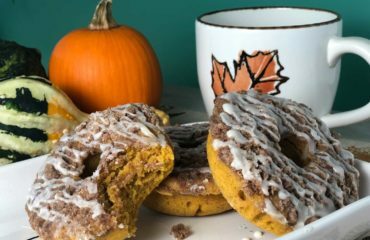 An autumn classic, this apple cider donut recipe will be your go-to every fall. They’re crispy on the outside and soft and moist on the inside. 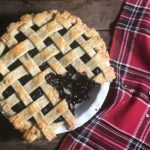 The maple sugar and maple glaze are just the cherry on top! 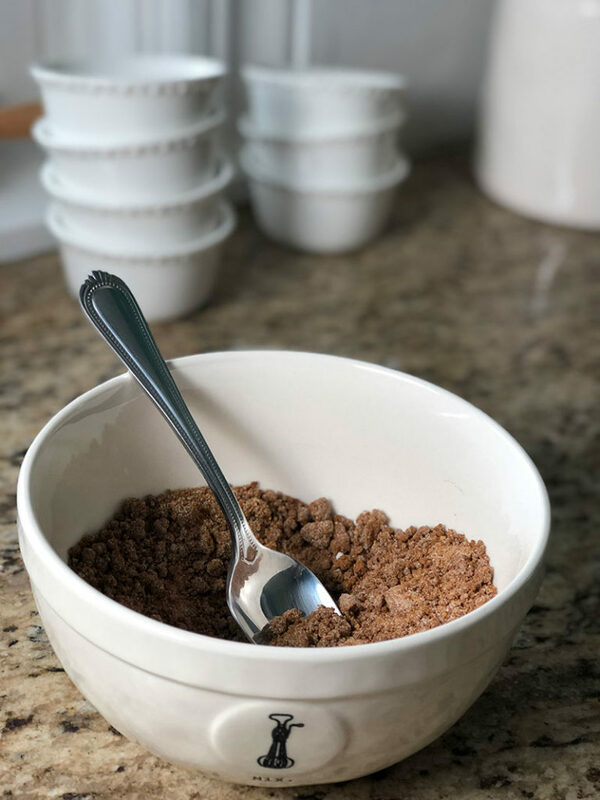 The shorter, printable version of this recipe can be found below, but read on if you want more detailed step-by-step instructions. Before diving into the recipe, I do want to point out that you will need a donut cutter. I use a 3 ½ inch one that I found on Amazon. You will also need a dutch oven or a fryer. 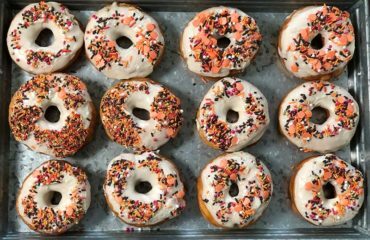 This recipe yields about a dozen donuts. First, boil the 3 cups of apple cider in a saucepan on medium to high heat for 25-35 minutes. Watch it until it starts to boil to ensure that it doesn’t boil over the sides of the pot. 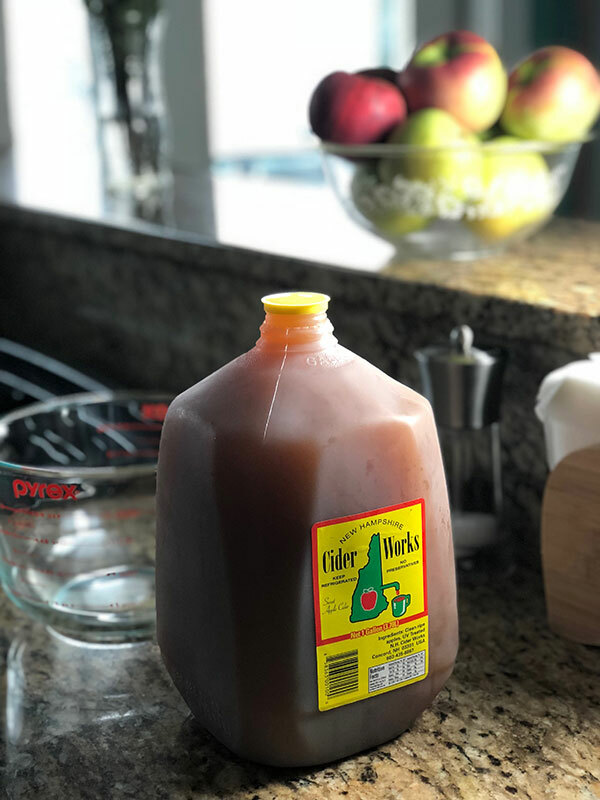 You want the apple cider to be reduced to about ⅓ cup by the time it’s done boiling. When you take it off the heat, measure out ⅓ cup and place in a medium sized bowl right away. Next, add the apple butter, buttermilk, and maple extract and whisk together until incorporated. Set the apple cider mixture aside. 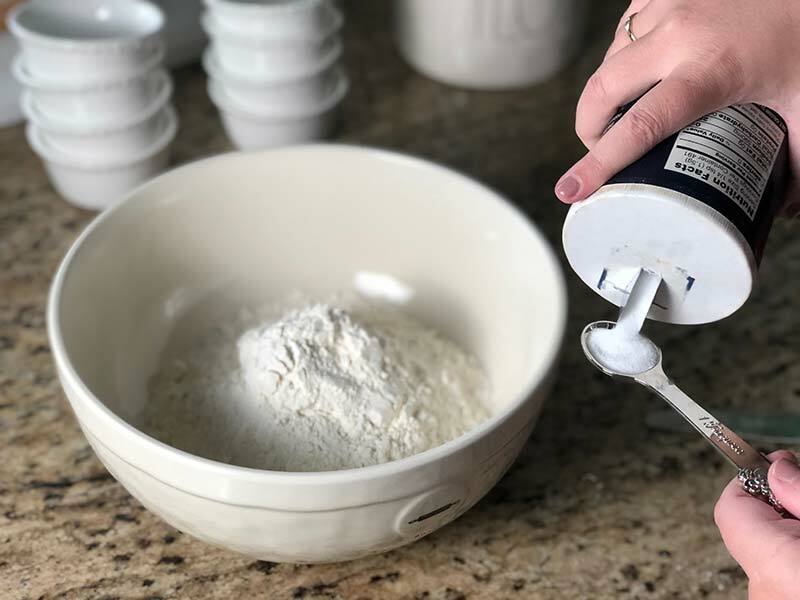 In a separate, large mixing bowl whisk together flour, salt, baking powder, baking soda, cinnamon, nutmeg, and apple pie spice. Set flour mixture aside. 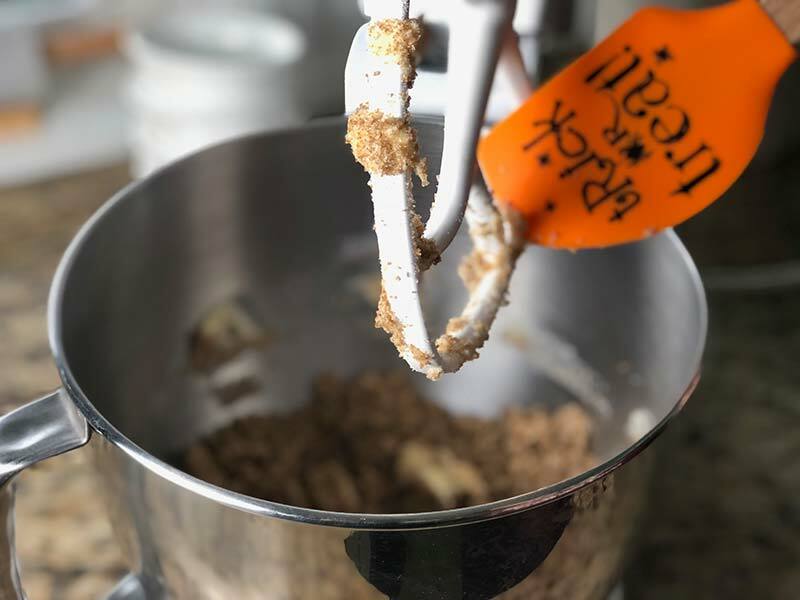 Take the apple cider mixture and add it to the sugar mixture in your KitchenAid. Beat well. Then, add in the flour mixture, starting off at a low speed so that the flour does not fly everywhere. Once the flour begins to incorporate, work up to medium and then high speed until you have a smooth dough. Rip off a piece of wax paper, about a foot and a half long, and set it out on a clean counter. Generously flour the wax paper. I’m talking a lot of flour. Scoop the apple cider donut dough onto the wax paper and sprinkle with more flour. 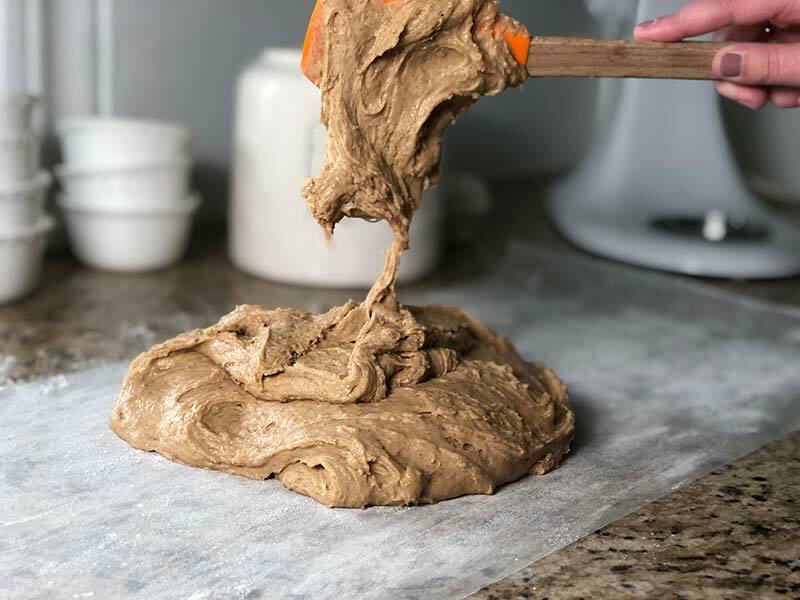 You want to ensure that the dough won’t completely stick to the wax paper when you’re ready to take it off. Once floured, wrap the dough up in the wax paper, almost like a present. You can use a couple pieces of tape to keep it closed. Place on a plate and put in the fridge for at least 4 hours. You could also make the dough in the evening and let it sit overnight until morning. 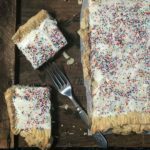 When you take the dough out of the fridge and unwrap it, it will likely be sticky. Generously flour a clean surface and scoop the dough onto the counter. Sprinkle the dough with more flour. Turn it over and do the same thing. Again, I’m talking a lot of flour. Use your own judgement in determining when you’ve put enough flour on. Ultimately, you want to get it so that the dough isn’t too sticky to work with. The process is almost like making sugar cookies. 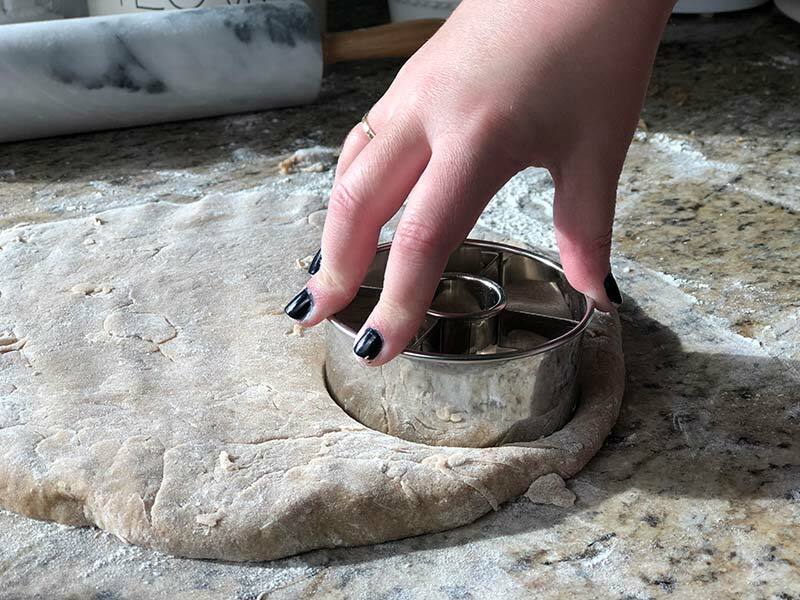 Once the dough is dry enough that it won’t stick to a rolling pin, roll out the dough until it’s about ¾-1 inch thick. Put a couple of plates nearby and sprinkle them with flour. Then, with the donut cutter, begin to cut the donuts. Combine the dough from the donut holes as you go so that they can be combined to make more dough for more donuts. As you cut the donuts, set them on the floured plates. This is very similar to making sugar cookies. 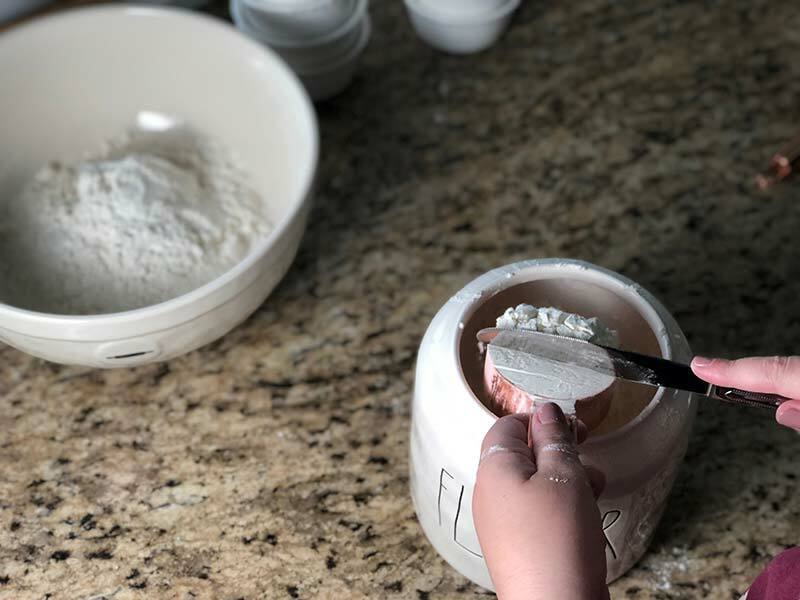 Keep cutting until you don’t have enough space in the dough to cut anymore, then roll it back up, flour it again, roll it back out, and cut some more. Repeat until you don’t have any dough left. Next, fill a dutch oven 3” deep with vegetable oil and put over medium to high heat (if you have a fryer, then you can of course use that instead.) Insert a cooking thermometer into the oil to measure its temperature. You want the oil to be at 360 degrees when you fry the donuts. It can be difficult to maintain the oil’s temperature on the stovetop. Continue to turn the heat down as necessary to keep the oil at 360 degrees. Set a couple of plates to the side of your stove and cover them with two paper towels each. Once the oil is heated to the right temperature, gently drop the donuts into the oil two or three at a time. Cook on one side 1 ½-2 minutes and then flip them over and cook the other side 1 ½-2 minutes. You can use frying tongs to flip the donuts, as well as to remove them from the oil when they are done. Set the hot donuts on the paper-towel lined plates. Fry all of the donuts and let them cool for about 10 minutes. 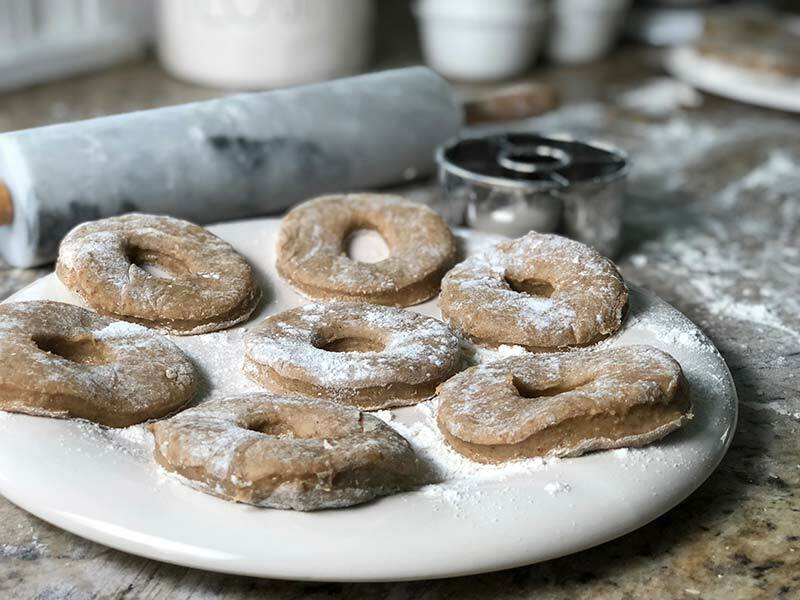 Traditionally, apple cider donuts are topped with cinnamon sugar—however, this recipe calls for some maple sugar as well to give it even more New England flavor. 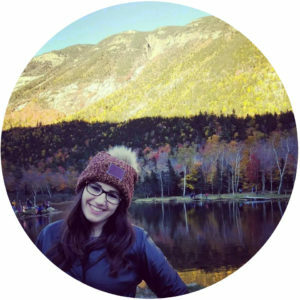 If you can’t get your hands on any maple sugar, no worries. 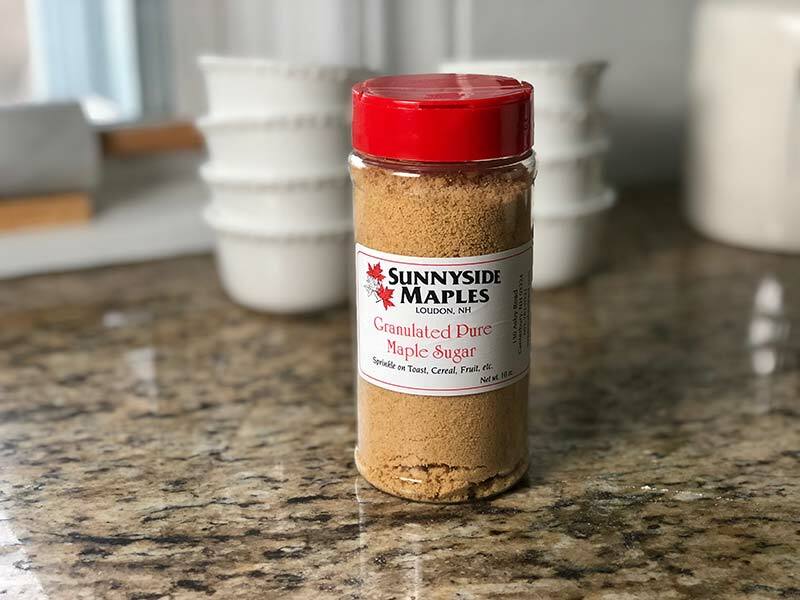 You can supplement it with ¼ cup more of granulated sugar, it just won’t have a maple flavor. In a small mixing bowl, use a spoon to combine the sugar, brown sugar, maple sugar, cinnamon, and apple pie spice. As you mix the ingredients together, break up the chunks of brown sugar as small as you can. Then, use a sifter to make the sugar very fine. 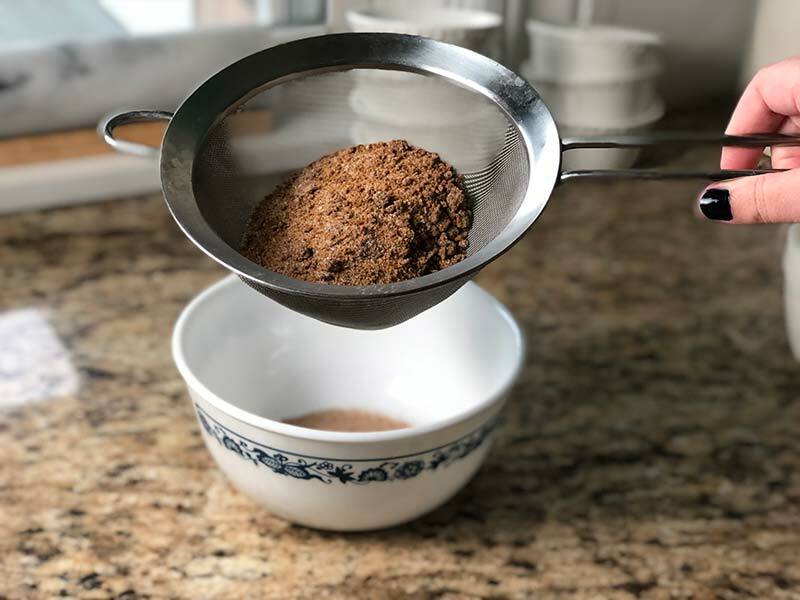 Shake the mixture through the sifter until nothing is left in it except chunks of brown sugar (which is to be expected.) Set aside for a moment. In a medium mixing bowl, melt the butter (about 35 seconds in the microwave.) Then, add the powdered sugar, half and half, maple syrup, and maple extract to the bowl. 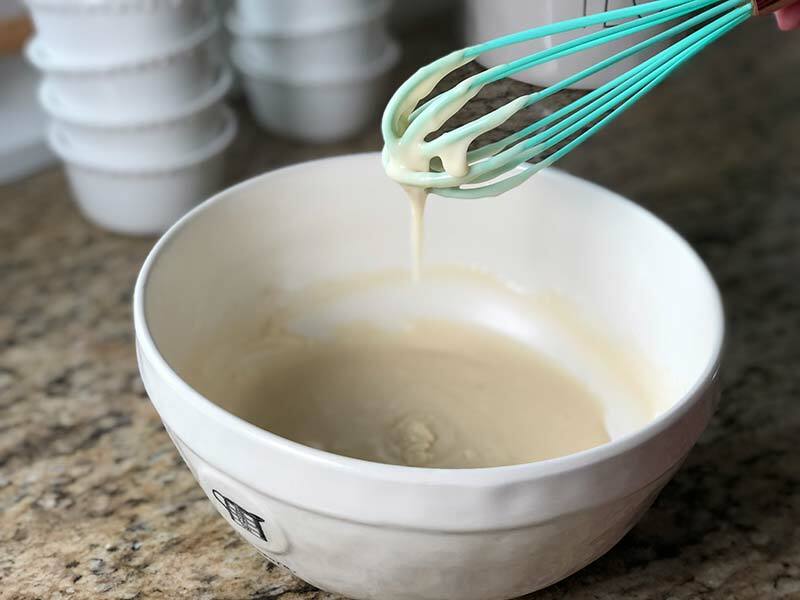 Whisk together until you have a delicious glaze. Note: if you wait a few minutes before icing the donuts, you can just pop the glaze in the microwave for 5-10 seconds to get it drippy and gooey again. One-by-one, place the donuts in the small bowl containing the sugar and spin the donut until it is covered in sugar. Turn over and do the same thing on the other side. Place the donuts on a plate once they’re sugar coated. 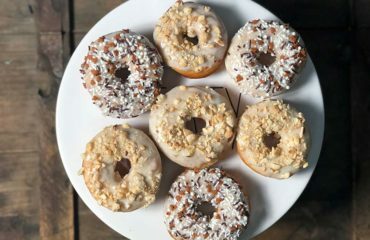 Last, using a spoon, drip the maple icing over the donuts. 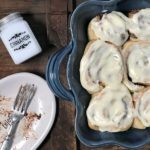 Serve right away while they’re still warm and sticky! 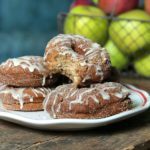 Can you store and reheat apple cider donuts? 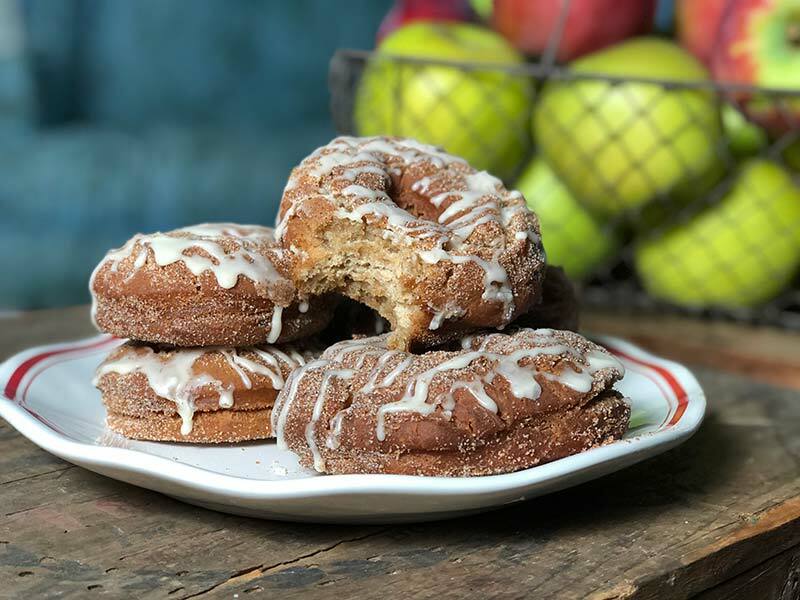 Fried apple cider donuts really are best when they’re fresh, and thus don’t last very long. You can store them for a day or two, they just won’t be as good. Your best bet would be to wrap each donut in tin foil and store them in a breadbox. You can reheat them in the microwave for 10-15 seconds to get them warm again too, though the bottom may get soggy once placed on a plate. Simply eating at room temperature the next day may be best. 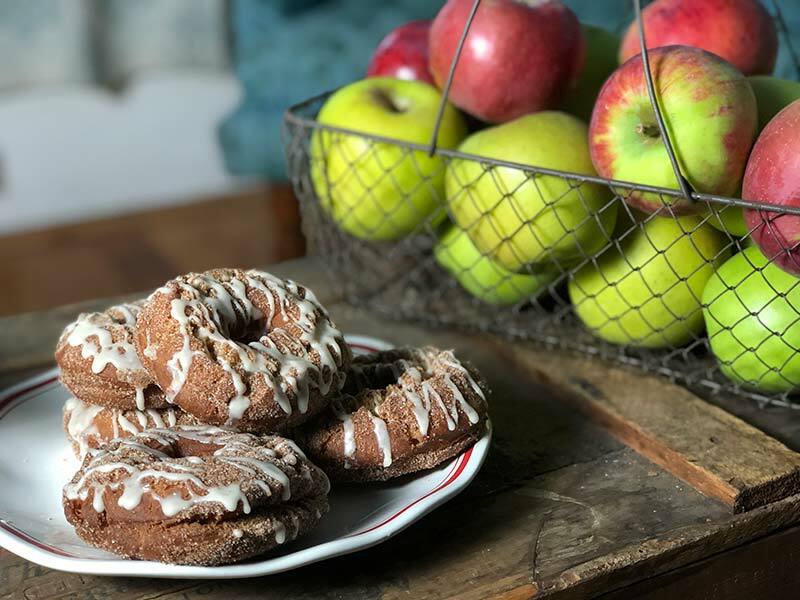 An autumn classic, this apple cider donut recipe will be your go-to every fall. They’re crispy on the outside and soft and moist on the inside. 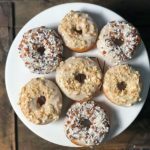 The maple sugar and maple glaze are just the cherry on top! In a saucepan, boil 3 cups of apple cider for 25-35 minutes, until reduced to about 1/3 cup. 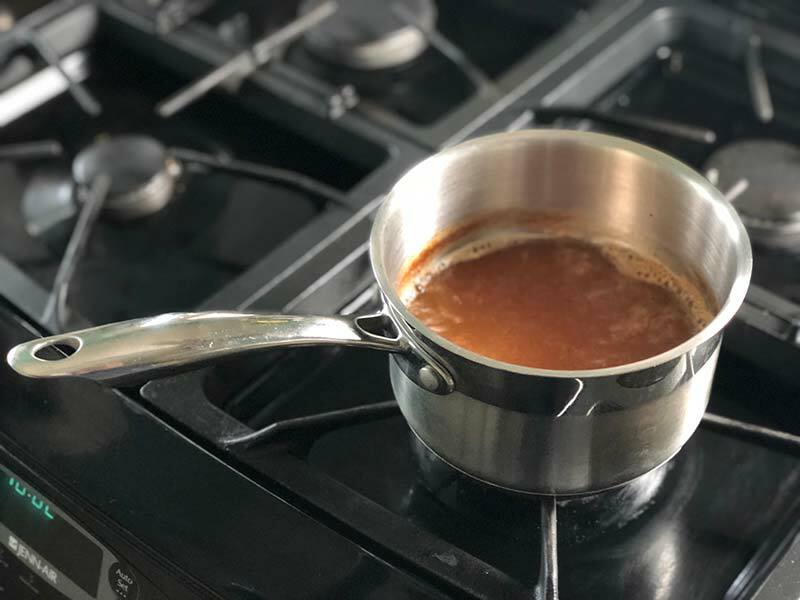 Remove the apple cider from heat, and measure 1/3 cup of it out immediately. Place in a medium sized bowl. 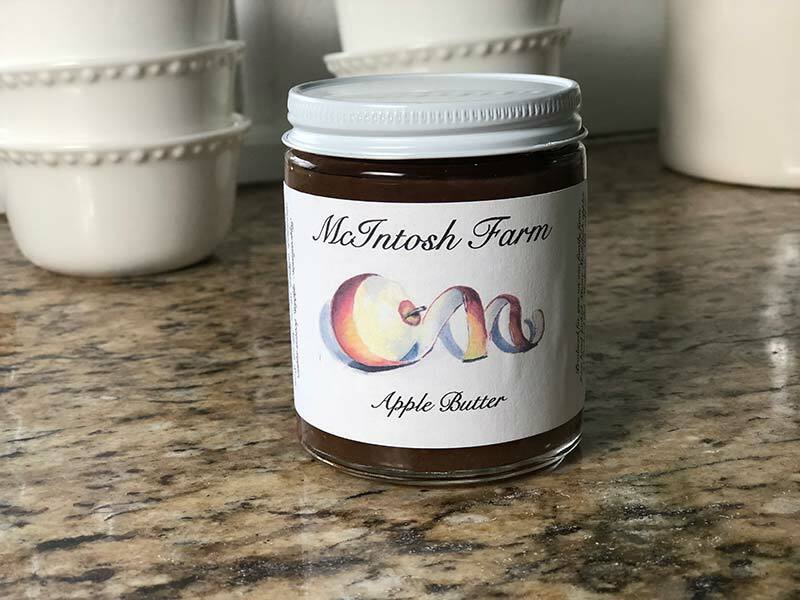 Add in the apple butter, butter milk, and maple extract. Whisk until incorporated. Set aside. 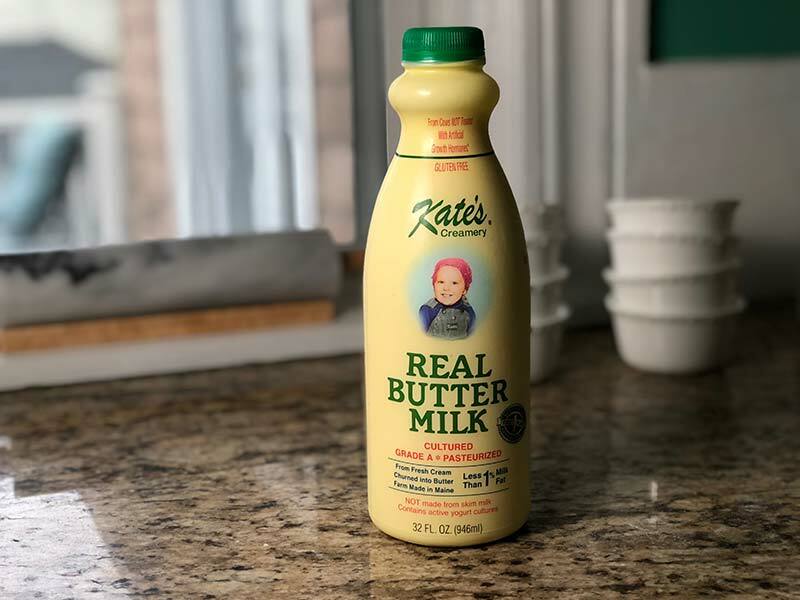 In a KitchenAid mixer, beat the sugar, brown sugar, and unsalted butter, which should be at room temperature. Add in eggs one at a time, not adding the second one until the first is fully incorporated. Once mixed, set aside. 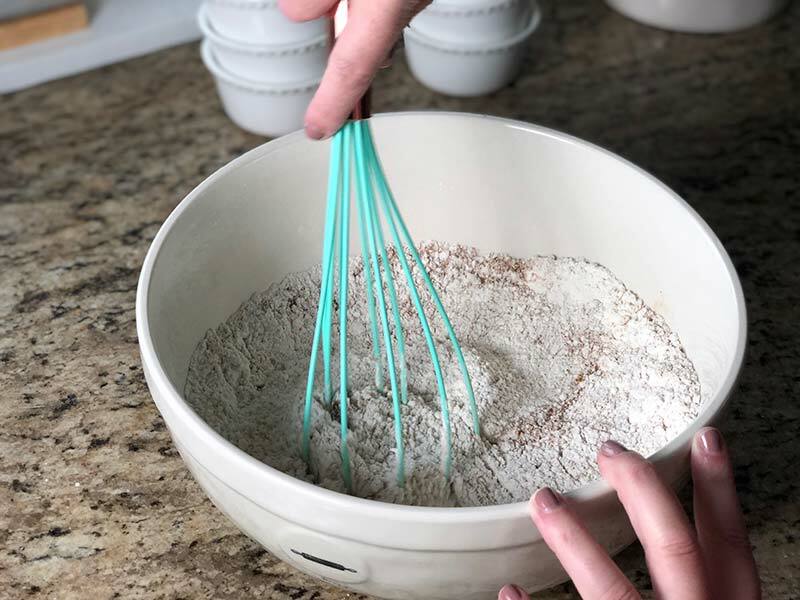 In a separate, large mixing bowl whisk together flour, salt, baking powder, baking soda, cinnamon, nutmeg, and apple pie spice. Set aside. Rip off a piece of wax paper, about a foot and a half long, and set it out on a clean counter. Generously flour the wax paper. 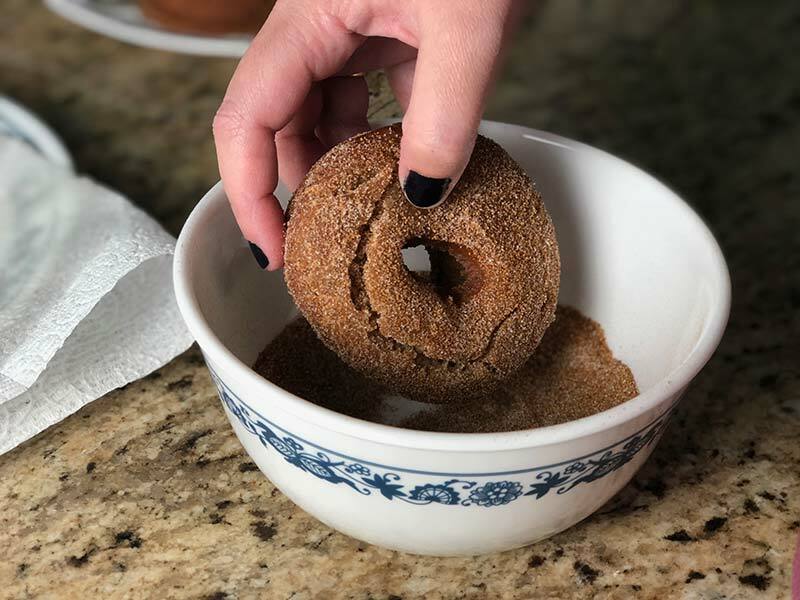 Scoop the apple cider donut dough onto the wax paper and sprinkle with more flour. Once floured, wrap the dough up in the wax paper, almost like a present. Place on a plate and put in the fridge for at least 4 hours. When you take the dough out of the fridge and unwrap it, it will likely be sticky. Generously flour a clean surface and scoop the dough onto the counter. Sprinkle the dough with more flour. Turn it over and do the same thing. 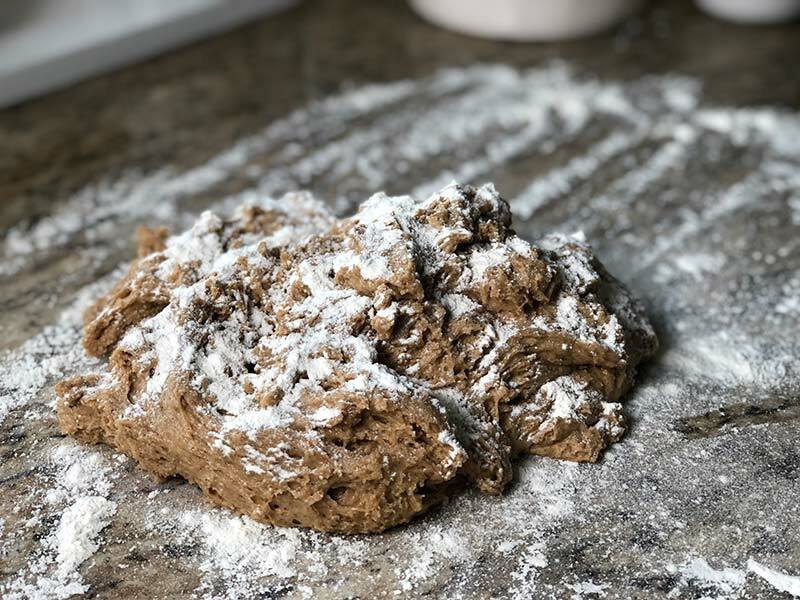 Once the dough is dry enough that it won’t stick to a rolling pin, roll out the dough until it’s about ¾-1 inch thick. Fill a dutch oven 3” deep with vegetable oil and put over medium to high heat (if you have a fryer, then you can of course use that instead.) 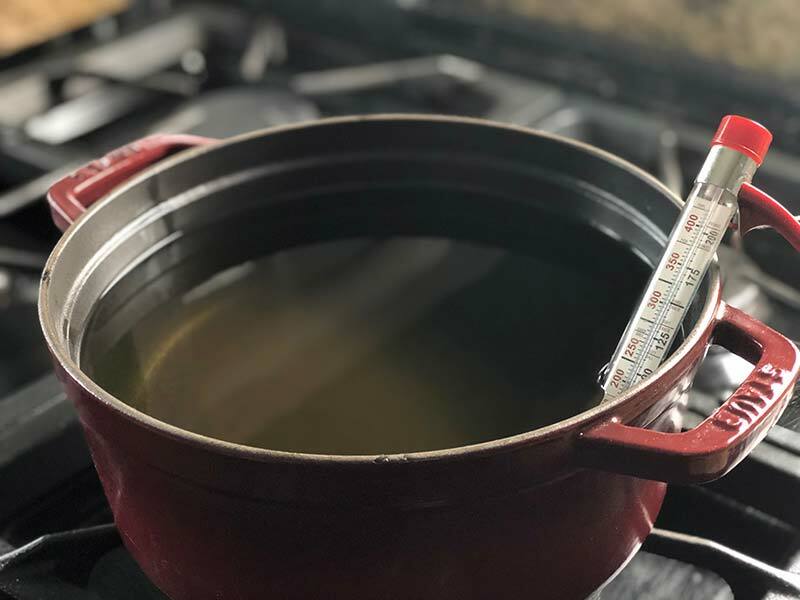 Insert a cooking thermometer into the oil to measure its temperature. You want the oil to be at 360 degrees when you fry the donuts. Set a couple of plates to the side of your stove and cover them with two paper towels each. 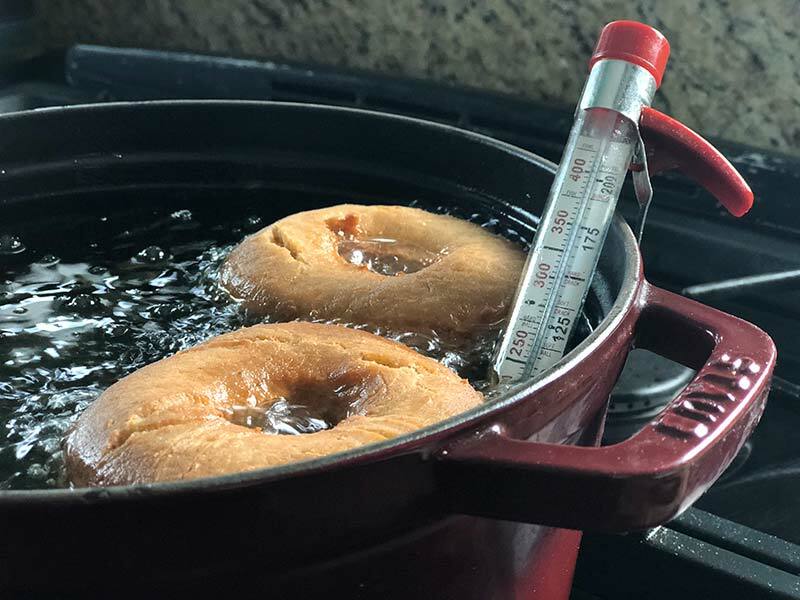 Once the oil is heated to the right temperature, gently drop the donuts into the oil two or three at a time. Cook on one side 1 ½-2 minutes and then flip them over and cook the other side 1 ½-2 minutes. Set the hot donuts on the paper-towel lined plates. Fry all of the donuts and let them cool for about 10 minutes. In a medium mixing bowl, melt the butter (about 35 seconds in the microwave.) Then, add the powdered sugar, half and half, maple syrup, and maple extract to the bowl. 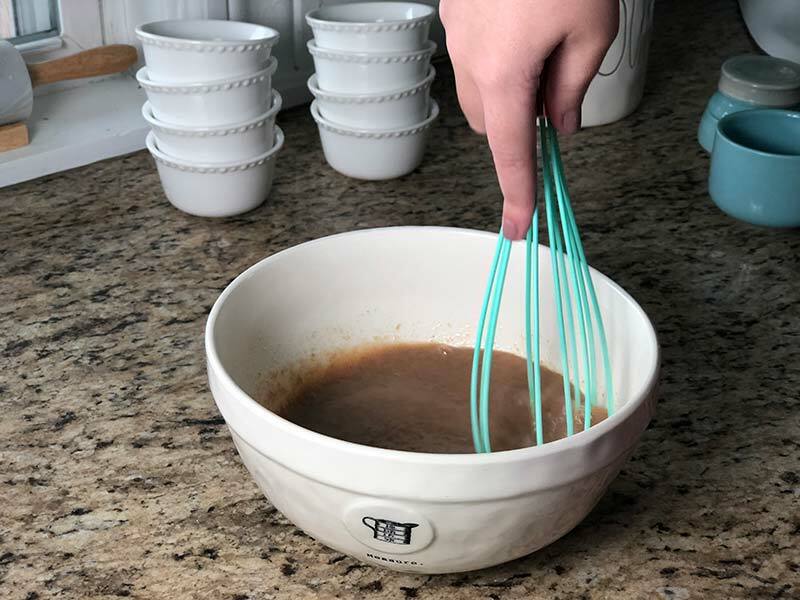 Whisk together until you have a delicious glaze. 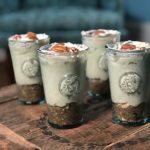 If you like this recipe, be sure to pin it! 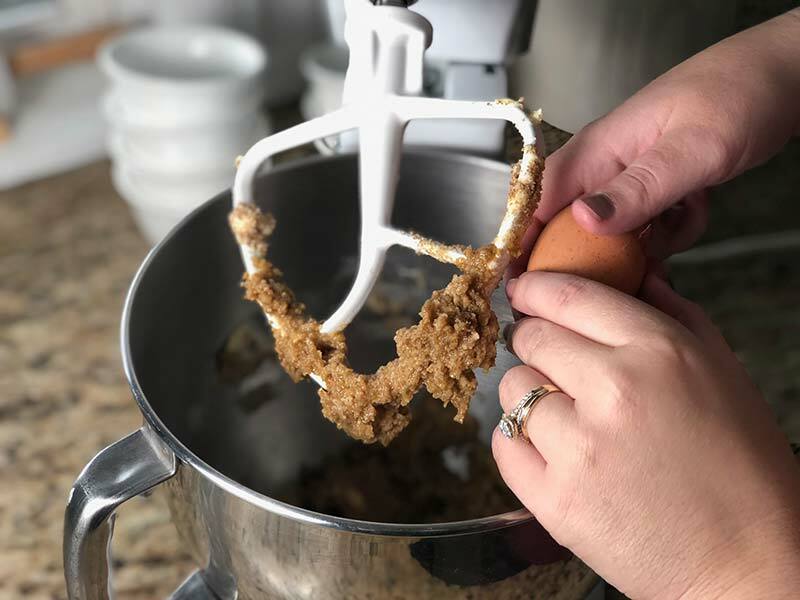 My love of baking didn't begin until my husband taught me how to use a Kitchen Aid mixer, but the rest is now history. "There was the doughty doughnut, the tender oly koek, and the crisp and crumbling cruller; sweet cakes and short cakes, ginger cakes and honey cakes, and the whole family of cakes. And then there were apple pies, and peach pies, and pumpkin pies; besides slices of ham and smoked beef; and moreover delectable dishes of preserved plums, and peaches, and pears, and quinces; not to mention broiled shad and roasted chickens; together with bowls of milk and cream, all mingled higgledy-piggledy, pretty much as I have enumerated them, with the motherly teapot sending up its clouds of vapor from the midst." Sign up to get e-mail notifications whenever a new recipe is posted!